Mac OS X is a multi-user operating system, which allows you to create different account for different users. You can store all your private and personal data to this account, which is not accessible by other users. Sometimes when users format/erase their important data from Hard Drive for safety and they think no one can recover it. But, it is not true, all data is still present in Mac hard drive and can be recovered by any data recovery software. So, It is important to erase data from Mac drive to insure security of your data. There are two methods to erase data from Mac beyond recovery. It is an inbuilt feature of Mac. If you want to keep some of your files, copy it to another place before formatting. 1. Click on Open disk utility option. 2. Select drive which you want to wipe from Disk Utility window. 3. 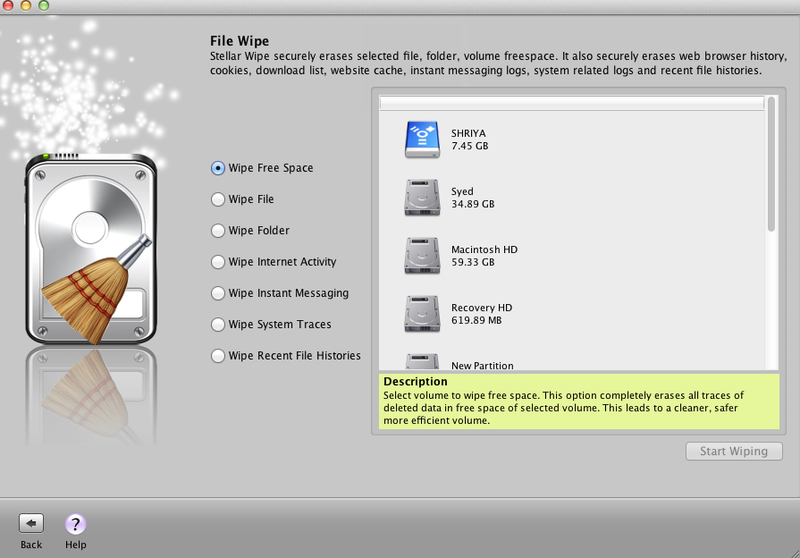 From right side of disk utility windows, click on Erase tab. 4. Select Mac OS Extended from Volume formated drop-down menu. 5. Give name to the drive which represent drive after wiping, in the Name field. Don't Erase Data- This will only erase information of files which is used to access files. Data can be recovered in this option. Zero Out Data- This will overwrite data with Zero. Tough to recover data from here. It may be time consuming. process. 7-Pass Erase- This process used in government organizations to wipe data. In this process hard drive data is overwrite seven times with garbage values. It is a time consuming process may takes hours to complete. 35-Pass Erase- Use this option when your data is very confidential. It is impossible to recover data after data get wiped. It is very lengthy process may take more then a day. 6. Choose any option which you want. By default, option is Zero Out Data. You can erase data from your Mac drive easily by Disk utility. 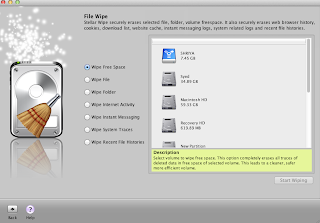 Mac wipe utility of Stellar drive toolbox helps to erase data from Mac hard drive beyond recovery. Features of this software allows you to wipe files, folders, Internet activity, system traces, instant messaging, recent file histories etc. 2. You can schedule wiping task. 3. Allows to wipe unused spce to increase efficiency. 4. Options to either File wipe of Drive wipe. This software can wipe data beyond recovery. It helps to unauthorised access of your precious data.